, hereditary holders of the post of Earl Marischal, charged with care of the Regalia but with the addition of a depiction of Dunottar Castle in the county, to recall a significant chapter in Scottish history when William Keith, the 6th Earl Marischal, took the Regalia to the castle for safekeeping against the army of Oliver Cromwell, the building being subsequently besieged. The castle’s governor, George Ogilvy of Barras and the minister of nearby Kinneff parish, James Granger, smuggled the items out of the castle and buried them under the floor of the parish church until restoration of the monarchy in 1660.
the last trace of the original town and county seat. The red and yellows colours and the sword are from the former civic arms of the county, the latter recalling the role played by Kincardineshire in saving the nation’s crown jewels. The origin of the county’s alternative name, “The Mearns”, is uncertain. It may be from the Gaelic words A’ Mhaoirne, meaning “The Stewartry”, itself deriving from “household guardian” i.e. “steward”. 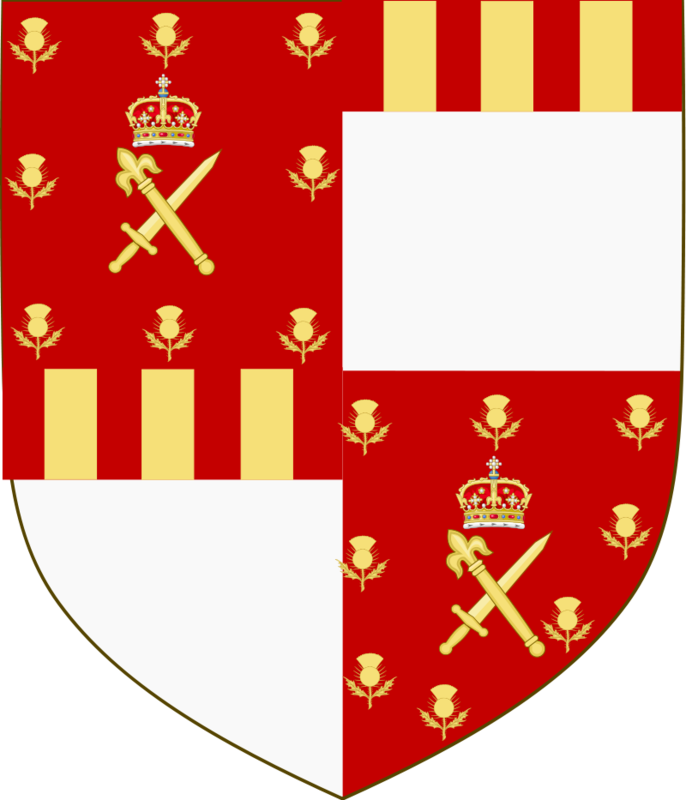 The protective imagery of the sword and castle together, thus also serve to represent the origin of the name Mearns. An alternative story is that it comes from “Mernia”, a Scottish lord to whom the land was granted, and whose brother, Angus, had obtained the adjoining shire of Forfar. This entry was posted in Kincardineshire. Bookmark the permalink.